Other types of arthritis (e.g. rheumatoid arthritis, gout) also affect hips, and may ultimately result in conditions that need the same kind of management as osteoarthritis. All non-operative treatment options should be exhausted before you consider hip surgery. Lifestyle modifications: can you avoid doing the things that make your hip hurt? Can you take some of the stress off your painful joint (e.g. by losing weight)? Surgery is often the long-term outcome of arthritis of the hip, but these measures may delay the need for surgery. Many arthritic hips require replacement. A hip replacement is a big operation, and is not risk-free. Dr Ward will discuss the probable benefits and risks of hip replacement with you during your consultation. All going well, a hip replacement can be expected to function for upwards of 15 years. Your hip replacement may need redoing after a period of time. Depending on what exactly needs changing, this is usually a bigger operation than the initial procedure. Dr Ward will discuss this with your during your consultation. 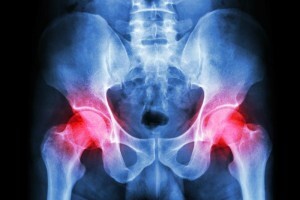 For further information on hip injuries, you may wish to visit Orthoinfo.